Do You See The Electrical Code Violations? Sparks Electric was recently on a residential estimate and while there, it is our custom to make a quick visual inspection. While in the garage at this home, I saw the wiring in the photo of the air compressor wiring, I just had to snap a photograph of this lethal look wiring. There isn’t anything safe here because the wiring was never installed per the NEC, the national Electrical Code, this is the electrical codes followed by an electrician. 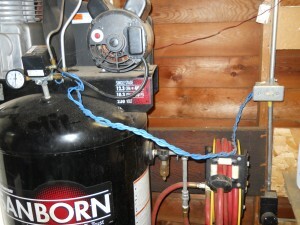 This is example of handyman wiring and what you can end up with. Fortunately, over the years that this shop tool motor has been wired, no one was electrocuted nor has the garage burned down, yet,… The home owner realizes he can’t sell the home with unsafe wiring like this so plans on having it removed before he sells the home. Still, if you decide to connect 120 volt or 240 volt wiring to any appliance or load, make sure it is wired correctly. Call an electrician and have the work done by a qualified and conscientious electrician, if you’re in the Greater Milwaukee Area, Sparks Electric at www.SparksElectric.com would be happy to come out and inspect, repair, or replace your unsafe wiring. A safely wired home can be a happier home and definitely a safer home. Thanks for reading our blog. This entry was posted on Tuesday, June 28th, 2011 at 1:45 am	and is filed under Uncategorized. You can follow any responses to this entry through the RSS 2.0 feed. You can skip to the end and leave a comment. Pinging is currently not allowed.